Paperback Version of My Children’s Book on How to Love Like Jesus is Finally Ready for Order! 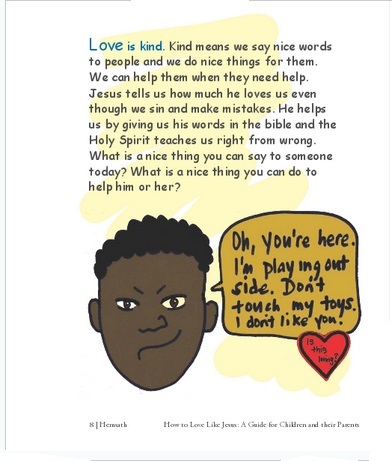 If you have been needing like me, a resource to help you teach your child how to love in action, I encourage you to buy the book. I wrote it for my sons. I wrote it for your kids. Its needed. There’s nothing out there like it on the market. And I don’t know about you, but my kids need some life application to what they hear in Sunday school or what bible verses they may memorize from their midweek Awana or CKC program they may be in. And if you don’t have your kids in either, than I’m sure you’d agree that they need life application of the bible regardless. My children love the book and enjoy the questions it asks and the funny illustrations I added in order to relate to their lives. I think you will find the $9.99 price worth the book. It is rich with information–enough for an older child to read in one sitting and a younger child to read section by section over a few days, like a devotional. Would love comments here as well and on my FB about how you feel about the book and how your kids received it. 🙂 More books to come. They are written. I just need to illustrate and design the layout. The more feedback from you the better I can make them. I want to make books that are needed. The ones to come: Roman Road to Salvation, The Fruit of the Spirit, The Body as Worship, and ABC’s of the Bible. « My Proof Copy is Here!